Not everybody in Maher Cup Country loved rugby league. E.O. Schlunke of Hope Vale, Reefton wrote prolifically about rural life in the Riverina. The stories are not pastoral in the manner of John O’Brien’s Around the Boree Log. They are usually vignettes with a dark edge. 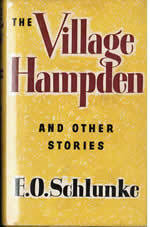 In 1956 he published a collection called The Village Hampden in which the eponymous story positions the Belluga Rugby League Club as the town’s central institution. Although the Club sees its role to foster community and local pride, it has become menacingly authoritarian, seeking to control many aspects of daily life. The story goes…. Tom Matheson, a young school teacher, has arrived in town. “It was a small town of only a thousand or so people. Normally one wouldn’t expect a town of that size to field a first-grade team that could put up a good showing against towns five to ten times its size, and even hold the group’s challenge cup at times for a significant part of the season” (p.203).